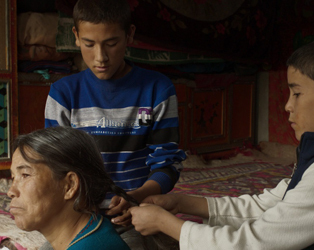 Chinese filmmaker Lina Wang’s astonishing debut documents the lives of China’s Uyghur Islamic minorities in the Northwest Xinjiang Province of China, told through the story of Isa, a Muslim farm boy, his friend Kalbinur, and their families. One by one family and friends leave, as each faces the life-changing implications of education, work and caring for their elderly and sick as the region expands and is modernised. A visual document of the erosion of the Uyghur community and the homogenisation of a unique culture through language politics (Mandarin becomes a requirement at school), this story is delicately told from a child’s perspective. A pure, contemplative atmosphere, combines with scenes of arresting beauty, and realist performances delivered by a nonprofessional cast.